Advertise your business on a monthly, bi-annual, or annual basis. There is a monthly fee for this option. When requesting advertising space via email, please include your phone number in your email so we can get in touch with you. Want to advertise your business with us? We offer top-of-the-line ad spaces for all promoters, vendors, and weapons-related businesses who wish to get their businesses noticed. We have advertisement spaces on every page of the site. The header spaces are site-wide, that is they appear on every page of the site – the site consists of over 200 pages and is continually growing. Month-to-month requires a minimum of two months, no contract required – Special Pricing and Offers are not available – Prorating is available on first month. Header ad spaces are reserved for business advertising only, no shows will be listed in these areas. All businesses located in our header must be gun, knife, militaria, antique weapon, ammunition, prepper, conceal/carry, or armor related; this includes venues. Promoters, Vendors, & Venue providers are businesses and therefore welcomed to take advantage of this offer for advertising their organization. Small header spaces are being considered for a resize with new dimensions, the changes will be for the betterment of the advertisement’s viewing and accessibility; those with agreements for these spaces will be notified when the changes have been decided, cost will not be affected at this time. You have the option to design your own or have us do it, prices will be the same regardless. Should you choose to make your own, please save them as either a gif, jpeg or png format – all other formats will be discarded. Please use the exact dimensions noted above for the size of advertisement you choose. The far right (Left-hand side) large header ad space is reserved for our logo. This option offers two free months (12 months for the price of 10) if paid in full in advance for business advertising and/or rotating banner spaces. This option offers one free month (6 months for the price of 5) if paid in full in advance for business advertising and/or rotating banner spaces. Those already locked in to a semi-annual or annual agreement will not be affected by price changes until agreement has come full term. 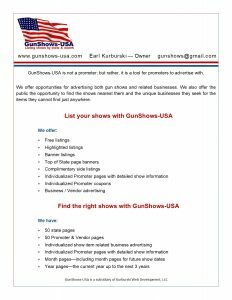 All billing is from Kurburski Web Development, LLC – the parent company of GunShows-USA. If you choose to have your marketer as your communication with us, please be advised, we do not work with third-party marketers unless they are the responsible party for making payments. Acceptions to this rule are on a per-client basis. You do not have to have a PayPal account to pay the PayPal invoice billing. Invoicing or recurring payment method requires credit or debit card. All monthly payments must be paid in this manner, no acceptions. You do have the option to call with your credit or debit card for making payments over the phone. We accept most cards including American Express, Discover, Master Card, Visa, and PayPal. Earl and Raschelle do not share the same office and phone. If you prefer to speak to Raschelle, please contact her at the office number. All personal and card information is kept private and secure. GunShows-USA will not sell personal and private information to any entity for any reason. Monthly payments are due within 5 business days of the date on the invoice billing. Delay in payments could cause a suspension of advertisement until payment is made in full. If advertisement is suspended, past due amount and up to 2 full months in advance will be required for re-publication of advertisement. 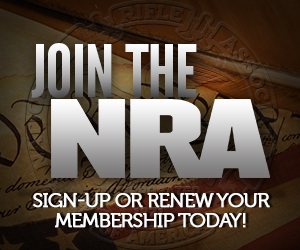 There will also be a requirement of automatic recurring payment which involves GunShows-USA having your credit card information on file for automatic collection of payments.